Collings Guitars Of Austin, Texas. C.F. Martin & Company is famous the world over for it's timeless and perfect acoustic guitars, but Martin is not without it's competitors. Among the manufacturers that some people think of as possibly being superior to Martin is Collings Guitars, and they are made in Austin, the capital city of Texas. As the story goes Bill Collings had set out for Southern California from Houston and made it only as far as Austin, Texas. We Texans are proud of this, as the meticulous craftsmanship of Bill Collings' guitars go a long way and around the world to show the kind of pride that Texans take in building things. It would be impossible to have a complete list of well known persons playing Collings Guitars, as the list is forever growing. The Santa Cruz Tony Rice Professional Guitar. The Clarence White D 28 By C.F. Martin & Co. The Collings Clarence White Guitars. Clarence White was one of the most famous flatpick style guitarist to have ever lived, and besides all of that - he's all and around one of the most creative guitarist to have ever lived. The end result of all this is that most everyone that plays a dreadnought style guitar with a pick has at one point or another been inspired by not just Clarence White, but the entire Clarence White legend and legacy, and various Clarence White industries. To be somewhat clear - the single most famous Martin Guitar in the world is the highly modified 1935 D 28 that Clarence White used to own and that Tony Rice now owns. Every good guitar manufacturer in the USA with only a few exceptions makes a rosewood and spruce copy of the 1935 very modified D 28 that is it's own legend, as the two most preeminent and copied flatpicking guitarist not named Doc Watson have both owned that one guitar. The story gets a little bit strange when one takes a moment to realize that Clarence White hardly ever really even played his more famous guitar - and so Collings Guitars went all out and made a Clarence White guitar that copied the Mahogany instrument that he did most of his acoustic playing with. The Collings Clarence White 28 guitar is probably the most famous and sought after Collings Guitar - and strangely enough, I'm somewhat a part of that story. I bought my Santa Cruz guitar from John Holman, who basically used my guitar as a semi template on how he would design for Bill Collings the Collings Clarence White 28 guitar. John Holman owned it, sold it to me after hearing me play the fire out of it at about 16 years of age, and I also got to play the prototypes and first production model Collings Clarence White 28 guitars all in the process. At some point or another in the middle of all of that I also got a brief introduction to Bill Collings. I'm truly not worthy. Now my Santa Cruz Guitar isn't a copy of the famous Tony Rice and Clarence White 1935 and heavily modified D 28, but it is an interesting variation of the Martinpre war D-28 design, but basically, Collings Clarence White 28 guitar and Santa Cruz's Tony Rice Professional Guitar are both nearly identical models - and they are BOTH copies of the exact same guitar, which as I hopefully explained above, are copies of one specific 1935 Martin D 28 that had been very modified from it's original form - most notable of the modifications is that the sound hole had been enlarged, and the fingerboard had been replaced with an ebony fingerboard with no fret markings to be seen on it. C.F. Martin and Co. has NEVER been anyone's fool, and so of course they got in on this game as well, and make their own Clarence White Model D 28 too. Have A Peek Into Bill Collings Guitars!!! The Collings Guitar Company makes many more flat top and dreadnought guitars than "just" the Clarence White guitars - they also make many other kinds of guitars, and mandolins as well. All Collings Guitars are built to specifications that are best described as perfect in every way imaginable. As much craftsmanship, love, dedication, and precision as is involved in the making of some of the world's most loved and desired dreadnought guitars; there is probably even more of all of those things involved in building more difficult instruments such as arch top guitars. If you've never spent any time thinking about it, then let me help you out - it's just harder to make a guitar arched on the top than it is flat, and that should be pretty close to common sense - the guitar pictured below sold used at over twelve thousand dollars - these are not just musical instruments - these are works of fine art. Arch top guitars have always been traditional instruments for jazz guitarist, and Collings Guitars makes them in sixteen inch, seventeen inch, and eighteen inch models. A 1990 Collings 18" Arch Top Guitar. 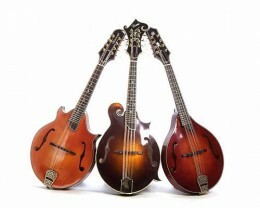 Collings also makes mandolins - both in the famous Gibson F-5 mandolinstyle, and in the more traditional "rounded" and more easily constructed style. Collings does NOT make any instrument that is not a professional style, quality, and priced instrument. All Collings instruments are hand crafted in Austin Texas by some of the highest skilled master luthiers in the entire world. You pay for quality, my friends, and you should never have to pay for it twice. If any Collings instrument is properly cared for - it never need be replaced, and will easily provided generations of persons a musical instrument of the very highest quality imaginable. I hope that I've given a bit of a glimpse into the appreciation and awe that I feel each and every time I get my hands on an instrument of as high a quality as are those made by Collings Guitars. But more than any of that - I like to hear the music. I've never owned a Collings, I own a Santa Cruz - which is every bit the equal of the Collings or Martin guitars, but I'm very proud of the wonderful state of Texas and the people here that are not politicians, except, of course, for Ron Paul. There's something to be said for men and women of integrity, and Bill Collings is one of them - his products are true labors of love, and the love is felt by every single owner of a Collings instrument. Though I've never owned a Collings instrument - I can't help but imagine that I will some day, I'm just that type of person. I have had my hands on dozens of them - so when I tell you what wonderful works of art that they all are - I'm speaking from a point of reference, and a lot of experience. Little doubt anywhere that Johnny Cash was one of the most loved singers and songwriters to have ever graced the United States of America by birth. Johnny has lived and died now, and left behind a ton of well loved songs, memories, and well, some guitars too. "Sir, it's mighty kind of you to call me a guitarist. I can't pick at all. 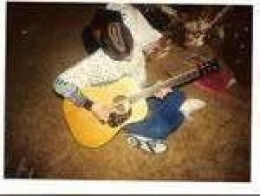 I just strum and sing." Strum and sing he surely did, and he did so exceedingly well and to the benefit of us all, and he did so particularly on one Martin D-28 guitar that you never saw, it was his personal guitar he kept at his ranch, and he did not perform with it, he kept it secluded and tucked away. 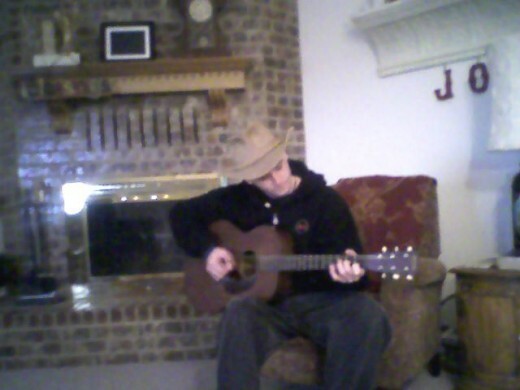 The Bon Aqua, he called it, and it was the guitar that he strummed while writing many a timeless song. Johnny Cash was a superstar, and I personally can't comprehend the rigors of touring, and the mental strain of having thousands and thousands of adoring fans yelling and screaming affection at you night after night - one must surely realize that such things affect a person, and not in an entirely positive way either. Johnny Cash used The Bon Aquaranch and guitar to get himself back into the proper state of mind following tours, and without that ranch and guitar, who knows? Perhaps he'd had burned out like so many others have. This exact guitar was the one he used to keep him sane, and it is the guitar most intimately connected to the late superstar, despite the hundreds or thousands of guitars that surely passed through his hands. 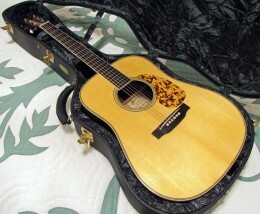 Now the Johnny Cash Bon Aqua Martin D-28 is very similar to the D-28 guitars owned by Jimmy Page of Led Zeppelin. These Martin D-28 guitars were not theHigh X herringbone style D-28 guitars played by persons such as Clarence White or Tony Rice, these guitars were constructed very differently. Traditional Martin D-28 guitars were herringbone guitars, and this one is not such an instrument, rather, it is constructed much more heavily for durability whereas the herringbone instruments were constructed very lightly for tonality. C.F.Martin & Co. did it right by simply always having the herringbone trim on one style and not having it on the other, and this makes it something more easily identifiable and less confusing. So far as these 1970's era Martin D-28's go, there are tons of them out there, and you can get them for less than you can a good one from the days when Martin reverted back to their classic designs. These guitars will still have that fine Martin sound, and if you find one that doesn't need any work done to it, you can get a real deal. This one, however, can only be seen at the National Music Museum. Johnny Cash, Live At San Quentin - With a Martin Acoustic Guitar. James Patrick, or "Jimmy" Page - A Guitarist Of Many Styles. I make no bones about it, Jimmy Page is one of the most influential guitarists to have played in the past one hundred years. No Jimmy Page isn't one of the most technically stunning or prolific guitarists of that time, but one of the most influential, and the reason for this, in my opinion, is because he could meld together so many diverse styles of music into the things he's recorded. Of course Jimmy Page is primarily known as the guitarist for Led Zeppelin, and that will always be true, and it was with Led Zeppelin that he primarily fused so many styles together. Now Page plays lots of guitars, but what is very noteworthy is that he was very much a proponent of the big three American guitar manufacturers, Gibson Guitars, Fender Guitars, and C.F. Martin & Co. guitars. He played no brand more than he did Gibson, however, and among his Gibson guitars is their acoustic flagship instrument, the J-200, which is perhaps, the world's most easily recognizable acoustic guitar. Jimmy Page's 1963 Gibson J-200. The Gibson J-200 is a huge instrument, in fact, it is the largest production acoustic guitar in the entire world, but that isn't all there is about it that makes the thing so easily identifiable, there is the strange signature mustache bridge as well, and of course Gibson's large block abalone inlay fret board markers always help. The very large pick guard with it's floral inlay arrangement is another beautiful identifier of these instruments, and well, they are pretty pricey too, you could easily trade one in for a car or truck with a lot of life left in it - but you can't play Joan Baez'sBabe I'm Gonna Leave You on a car or truck, unless it happens to be playing on the radio. The Baez tune wasn't the only song James Patrick Page recorded on the Led Zeppelin debut album with a big old Gibson J-200 though, he also used the guitar to record Your Time Is Gonna Come, and Black Mountain Side. Jimmy Page's particular J-200 was a 1963 model with figured maple back and sides, a solid spruce top, a five piece laminated maple neck, a rosewood "closed" mustache designed bridge body with pear block inlays, black pear bridge pins, and an ABR "tune o' matic" adjustable metal inset like the Gibson Dove guitars of those years had. The fingerboard or fretboard of the guitar was ebony with pointed end crest abalone inlay for fret markers. The headstock was bound with pear plant inlay of abaolone, and the celluloid pick guard was had the requisite abalone flower motif inlay. 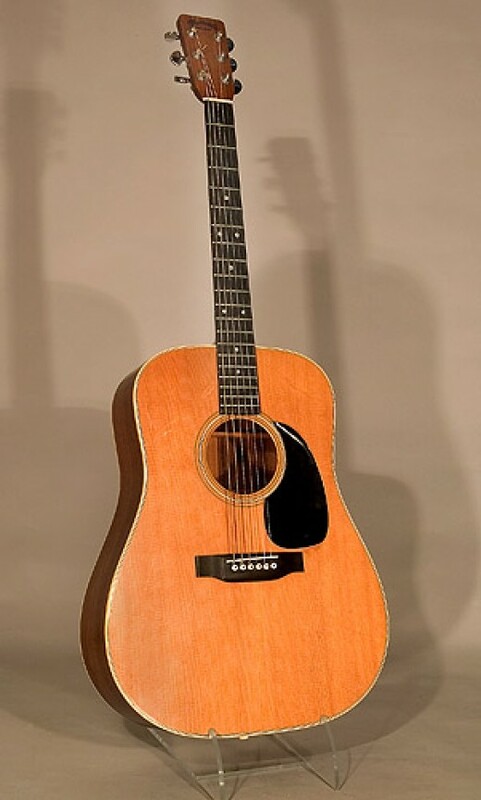 This big and beautiful Gibson J-200 only appeared on the first Led Zeppelin album and in 1970 was stolen.but on April 26, 1970, Jimmy Page used it to perform Black Mountain Side/White Summer on the Julie Felix show on the BBC. 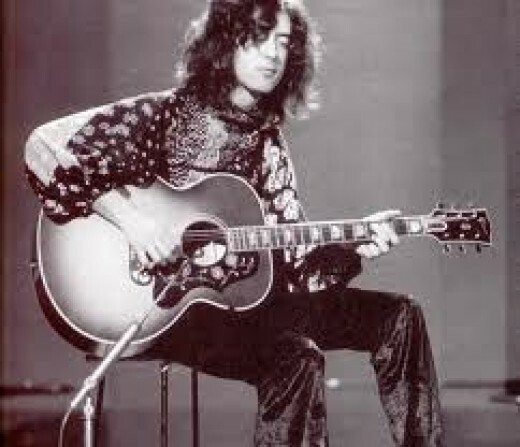 Jimmy Page With His Gibson J-200 Performing Live On BBC Television! Emmylou Harris, Folk Music, And Gibson Guitars. Born in 1947 in the outskirts of Washington D.C., its perhaps surprising that Emmylou Harris became the queen of progressive country and folk music. She'd moved to Greenwich Village in 1969 to become a folk singer - but seemingly failed, and moved back home to wait tables, be a single mother, and perform in small coffee shop venues. In 1971 that all changed forever when she met Gram Parsons, formerly of The International Submarine Band, The Byrds, andThe Flying Burrito Brothers. 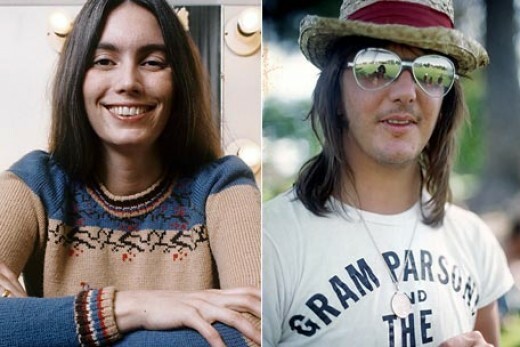 Gram Parsons had attended Harvard, was born a millionaire, and had a vision of what he called Cosmic American Music, and he made Emmylou Harris a big part of that as his singing partner. Emmylou and Gram recorded the albums GP and Grievous Angel together and then Gram Parsons promptly died of a drug overdose. Following that, the bizarre case concerning his body, which was stolen by friends and burned in Joshua Tree National Park - Harris was left a budding star in her own right, and the remnants of Gram Parsons's band, and his vision of Cosmic American Music. Written Following The Death Of Clarence White - In My Hour Of Darkness - Emmylou Harris and Gram Parsons. Phil and Don Everly, The Everly Brothers - had both originally played Gibson J 200 guitars. Over the years and with their personal feedback - Gibson has issued Everly Brothers model instruments either under that very name, or named the Gibson J 185. Emmylou Harris - Acoustic Guitar Girl. I'll just have to come out and say it - I think of Emmylou Harris as one of the world's most beautiful women. There's no two ways about it. She may be past the age when most people consider a woman truly beautiful - but not me, buddy, not me! She may be quite a lot older than me - but that white hair is absolutely a crown of wisdom on her, and she's as beautiful now as she ever was. I'm very opinionated, and especially when it comes to music - but I'm talking feminine beauty right this moment, and Emmylou was already beautiful, and already had the singing voice of an angel - but then she picks up an acoustic guitar and plays the thing whilst being beautiful and singing beautifully, and the the three tiered assault of beauty is then pretty much overwhelming. Emmylou Harris was featured on the front cover of the August 2001 copy ofAcoustic Guitar Magazine, and there's little doubt in my mind that she's been on their cover, and other similar publication's covers several times since then. She is well known as a rhythm guitarist, and primarily plays Gibson acoustic guitars. 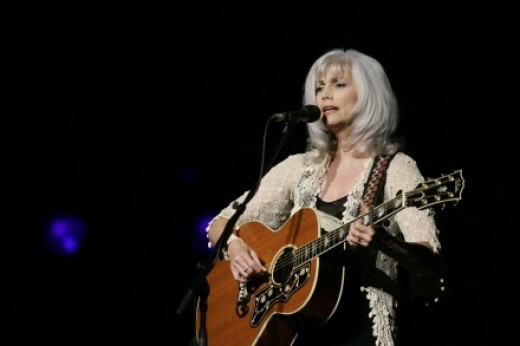 Emmylou Harris owns a number of Gibson guitars, most of them J 200s, which she considers the best acoustic rhythm guitar that there is, she also owns a similar Everly Brothers model by Gibson. Most often Emmylou Harris has been seen playing a blond Gibson J 200, which she inherited from Gram Parsons following his death - she's retired that instrument from being taken with her on the road, and had as exact a duplicate as possible built for her by Gibson. While Ms. Emmylou Harris has most always been known for playing Gibson guitars, she also owns several Martin instruments as well, including an M - 38, an OM - 42, a prized 1937 00 - 28; and a Martin J - 40M. Emmylou Harris With Her Gibson Everly Brothers Guitar Singing "Pancho And Lefty," by Townes Van Zandt. Emmylou Harris - Singer and Songwriter. Throughout most of the career of the beautiful Emmylou Harris, she's mostly been known as a singer who interprets the work of other songwriters in the manner and form that had been laid out for her by her late partner, Gram Parsons. Emmylou had mostly not written her own songs, why should she? There was always plenty of music out there that she could bring to life with her beautiful singing voice, and restrained phrasing style. But she decided to write songs of her own again, as she had once before, and she did so so well that she won a Grammy for Red Dirt Girl in the Best Contemporary Folk music category in 2000. The Emmylou Harris Gibson Interview. Official Gibson site: Grammy award winner, contemporary country music legend Emmylou Harris says Bob Dylan, Joan Baez, Son House, Pete Seeger, the Carter Family, Bill Monroe and Leonard Cohen are among her early musical influences. With the feedback from Ms. Emmylou Harris, the Gibson Guitar company created this instrument, the L 200 to be smaller, thinner, and more manageable for her - It's basically a smaller version of the slightly larger J 200, but with some custom appointments that let you know that this instrument is distinguished in ways other than it's slightly smaller size - it's similar in size to the Everly Brothers instrument which is also sometimes called the J 185 - depending upon which year it is, literally. This is a fine guitar that would make an outstanding instrument for a flatpicker, fingerpicker, or of course, a singer songwriter who plays rhythm. It's of solid maple back and sides, and with a solid Sitka spruce top, features custom mother of pearl inlay on the rosewood fret board, and on the bridge. Gibson's Gotoh tuning machines are a point of pride for efficiency and sustained accuracy. I've priced this outstanding instrument at around $ 3,300, and of course that comes with a limited lifetime warranty, and a hard shell case. This guitar comes pre equipped with Gibson's LR Baggs pickup and electronics for acoustic/electric play. The Gibson Emmylou Harris Guitar! Emmylou Harris - The Sweetheart Of The Rodeo. The Gibson Nick Lucas Special, a Twelve Fret Acoustic Guitar Beauty. 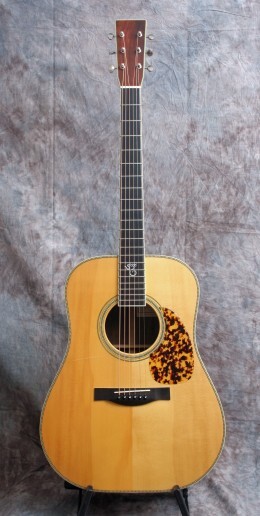 The Resurgent Gibson Nick Lucas Model Acoustic Guitar. The Gibson Nick Lucas guitar is truly a special guitar, and in recent years it is making a huge comeback as far as a collector's piece of prized value, and a choice model guitar for flatpickers, and this is especially due to the beautiful guitar playing of Norman Blake. This great Gibson acoustic guitar is a much smaller instrument than a typical Martin or Gibson model dreadnought flat top, and the Nick Lucas model is also different from the norm (pun intended) in that it is a guitar with twelve frets clear of the body, rather than fourteen. Norman Blake, of course, is not just a guitarist - but a multi instrumentalist who happens to be most associated with the acoustic guitar. Traditional music typically sounds best on great American Vintage Guitars, and Norman typically finds old songs to perform that virtually no one else remembers, and when he finds an old instrument with which to perform them, and make them shine - he brings both the songs and instruments back to life for us all. 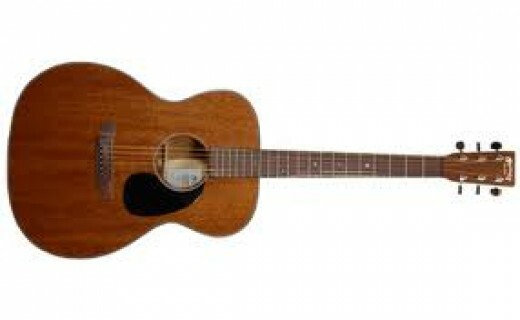 The Gibson Nick Lucas model acoustic guitar is a guitar with a slightly arched, spruce top, and mahogany back and sides. It's a larger guitar than the Martin 000 18 guitar, which would be it's closest Martin model in comparison, but the Martin 000 guitars are 14 frets clear of the body acoustic guitars, and this Gibson model is a twelve frets clear of the body guitar. 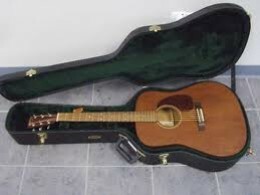 The slightly arched top isn't a common or easy thing to achieve, and the nice mother of pearl, or abalone inlay in the neck of the guitar are also things that make this a very nice guitar, and one that will be more expensive than the typical mahogany back and sides, and spruce top instruments on the market. Now, there's not data available to me, but I have to take the great Norman Blake's opinion here, and that is that the twelve fret model guitars seem to produce "punchier," or more distinct notes; and when you combine that with tonal immediacy that comes with mahogany back and sides, you have to realize that this is going to be a loud guitar, and an excellent instrument for playing both leads and rhythm. These guitars are always painted black, but I'm positive that this instrument could be ordered from the Gibson factory in sunburst, or natural finish as well; and besides that, there are now so many fine, small production lutheirs in the United States and Canada, that with some patience and money, one could have an exact copy built, or hot rodded up to your specifics, if you're into that sort of thing. The Gibson Nick Lucas Guitar! Both the original Gibson Nick Lucas model acoustic guitars, and the modern reissues are bound to be some fine, heirloom, and collectable model guitars. These are the types of instruments that one buys for professional work, or simply because you love instruments like this, and can afford them. Though this guitar is going to be a louder guitar than most Gibson acoustics, it's not something that is going to compare, really, to the volume that can be provided by a Gibson J 200, or Gibson SJ 250 Monarch; however, this guitar is going to be so much smaller compared to those great, and very large models, that it would be much easier to manage for the averaged sized man or woman. 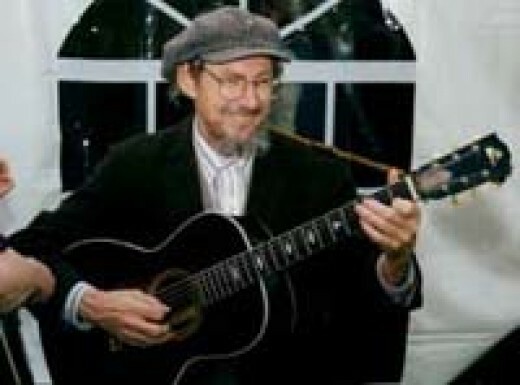 Norman Blake is the man who has brought this model back to the forefront of the acoustic guitar market; and perhaps he should be thanked for that if you ever get to own, and love playing on of these fine instruments, with roots deep in American pop and folk music. This Guy Plays Several Gibsons, and He Can Play! What Is A "Smartwood" Guitar? A "conscious" guitar, made in keeping with ecological responsibility, the Martin SWDGT features a solid Sitka spruce top, certified solid cherry wood back and sides, mahogany neck, and a certified katalox bridge and fingerboard. The neck has a low profile shape and an adjustable truss rod. Appointments include pearl dot inlays and a natural satin finish for enhanced tone. Made with specifically ecologically sustainable woods. Basically, this guitar is the most ecologically friendly instrument on the planet. It's the guitar that every conservationist and tree hugging type the world over can buy, play, love, tell their friends about - without a bit of guilt. Yes, this is a REAL Martin guitar - it's all solid wood in construction - no laminates at all, but even though it's a guitar with a solid Sitka Spruce sound board top - the wood is classified by Martin as RESCUED. The back and sides of this instrument are solid cherry, and Martin classifies this wood as Sustainable Solid Cherry. I don't typically like to write articles about guitars that I've not handled and picked out a tune or a dozen on. I think that I have played this guitar in a guitar center, but I'm not certain. I tend to pick up and pluck something out of every guitar that I see. The simple facts of the matter here are I just trust C.F. Martin & Co. with everything that they do or say. They are, after all, the world's premier acoustic guitar manufacturer, and so far as I know, the oldest company in the United States of America. Nobody has as much potential interest in the world of acoustic guitar manufacture as does C.F. Martin & Co. When it comes to sustaining, and making sustainable, steady supplies of tone woods for guitars - these trees are acoustic guitar manufacturer's very life's blood, and the C.F.Martin & Company only make the world's most highly reputable guitars. The only thing about these guitars that make me wonder is the fingerboard material, which is Solid Sustainable Katalox. I've just never heard of this Kataloxstuff, but if Martin is using it, I'm certain that it is good wood. Typically either ebony or rosewoods are used for fingerboards. I've got a guitar with each - and I'm certain that ebony is the better material for fingerboards - but like I said, if Martin is using katalox for these guitars, I trust them that katalox is an outstanding material for the purpose. The Martin people, if not the best in the entire world, are the definite equals to any others. 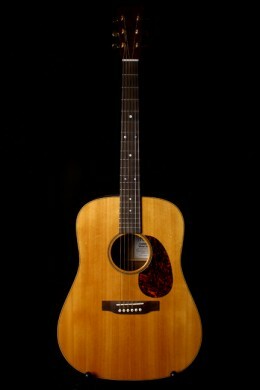 The Martin Smartwood Dreadnought Acoustic Guitar. First of all (and speaking from a steel string guitar perspective), let's discard the notion that some species of wood make good instruments and that others don't. The concept of tonewood is a hoax. Of the few things that we can do to a guitar and still call it a guitar, changing the wood it is made of will have the least impact upon the quality of the sound that it produces. The tonal difference between a mahogany guitar and a rosewood guitar is exactly the same as the difference between two mahogany guitars or two rosewood guitars. Can you tell what a guitar is made of while listening to an unfamiliar recording? No one I know claims they can. No one at the blind listening sessions I've attended could reliably distinguish between mahogany and rosewood guitars, or maple and koa guitars for that matter. - John Calkin. So far as the paragraph above is concerned. I totally disagree with every word of it. I CAN hear the difference between a Rosewood guitar and a Mahogany guitar. Besides that - nine times out of ten I can hear the difference between Brazilian Rosewood and East Indian Rosewood guitars. I just can. I can hear the difference between a Fender Stratocaster, Telecaster, and I can always hear a Gibson Les Paul; So Mr. Calkin might know what he's talking about when it comes to building guitars - but I think his hearing has been damaged a bit at this point. The American Wild Cherry as a tonewood is said to produce a tone sonic-ally somewhere between that of a maple and that of a mahogany bodied guitar. That being the case, my personal recommendation to someone shopping for a guitar like this would be to pick up a Martin D 18 and play it for a minute, then pick up the Smartwood Martin and play it for a minute - they are going to sound similar, and in a base level D 18, the price will be within a few hundred bucks or so of being the same as the Smartwood. Choose the one that you want, and remember that guitars such as any solid wood guitar made by C.F. Martin and Company - always sound better with years of playing behind them. These guitars retail at $1,400.00 dollars, and as do all Martin guitars, they come with a lifetime warranty to the original owner, and a hard shell case - that's probably environmentally friendly too. Have a Listen To some Music on a Martin Smartwood Guitar!